My latest Register column is a critique of Web 2.0, arguing that it represents a similar form of 'economic imperialism' as that promoted by Chicago School economists such as Gary Becker. In each case, utilitarianism is lifted outside of the realms of bureaucratic, economistic service delivery, and pushed into areas of our lives that were previously untouched by instrumental, egocentric rationality. In short, efficiency gains are no longer being sought only in economic realms such as retail or public services, but are now being pursued in parts of our everyday lives where previously they hadn't even been imagined. Web 2.0 promises to offer us ways of improving the processes by which we find new music, new friends, or new civic causes. The hassle of undesirable content or people is easier to cut out. We have become consumers of our own social and cultural lives. It's here that the connection with Gary Becker becomes plain. Where Becker took the utilitarian assumptions of economics and pushed them into areas of society seemingly untouched by rational self-interest, Web 2.0 takes the efficiency-enhancing capabilities of digital technology and pushes them into areas of society previously untouched by efficiency criteria. Following the news that the Queen isn't a cantankerous power-crazed old bat after all and Blue Peter's record-breaking fine, a nervous amnesty has spread out across the world of Reality Television, with Mark Thompson inviting other BBC programme-makers to confess to their sins, and Channel 4 now making the shocking admission that, contrary to representations, Gordon Ramsay isn't actually an expert sea-fisherman. The question is whether the media execs will face up to the profound differences between the values that they claim to hold dear and those that underpin reality television in general. It's not at all clear that a fact-checked, authoritative version of reality television is possible, because to clean it up would destroy what it is that makes it such a draw in the first place. The fundamental issue is this: Reality Television is about form not content, and thereby inverts the core principle of quality journalism. The whole point is that the content is banal (people cooking, arguing, sitting around, flirting) but that the mediating technologies (the camera, the editting suite, the presenter) are played with in such a way as to produce compelling television. An 'honest' reality television would be self-defeating; you might as well stare at your own flatmates for 45 minutes. Instead, reality television distorts, manipulates, refers to itself, because the objectifying properties of television equipment are brought within the frame of entertainment. 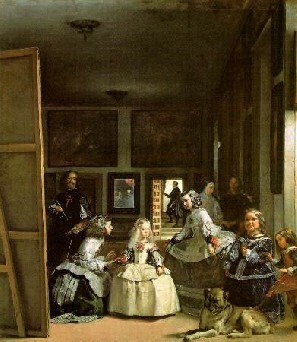 Foucault's famous analysis of Las Meninas (the painting here) in The Order of Things touches on precisely this point: for the first time the artist appears in the painting, and the act of representing has become internal to the representation. To which the postmodernist media theorist says 'but hasn't it always been like this? hasn't the BBC news always been laden with representational politics, the only difference being that editorial disputes previously happened without us knowing about them?'. To which the answer is yes, but that is at least not what the editors thought they were doing. The postmodernist reply is 'so is it not better that people know what they're doing? Isn't it right that editors reflect on the arbitrary nature of how facts are collected and presented'. Perhaps, but can you be certain that the viewer and the viewed are necessarily of the same persuasion? Manipulation of form may titilate the viewer, but when things backfire they - and the viewed - will suddenly rediscover their commitment to objective truth, and use it as a stick to beat the broadcaster with. What is worse is that reality television not only deliberately plays with form, it laughingly denigrates content. In the same way that Heat magazine revels in using telephoto lenses to reduce film stars to specimens of celulite, reality television uses television equipment to turn people, famous or not, into emotional wrecks. Loss of emotional self-control is the leveller and main spectacle, with rage as the most sought-after. Be it on Big Brother, cooking programmes, home improvement or whatever else, it is the tears, the shouting the breakdown or - yes - the storming out from a photo session over a tiarra, that bankroll this cultural vacuum. And it is not the fact that it happened that counts, but the fact that it was filmed and broadcast. But it seems unlikely that the BBC will pull out of this Faustian bargain - to redivide fact from fiction would leave them open to the charge of looking elitist and liberal once more. Similar problems are at large elsewhere, such as foreign news reporting that is increasingly dependent on big names and big egos to channel the news. One can at least respect the fact that John Simpson seeks to explore what our country is doing to the Middle East, but one wonders why he needs quite so much of himself in the story. I sympathise with the broadcaster's dilemma: without Simpson, the fear is that people will switch over from coverage of Iraq to find out what's going on in the Big Brother house. The BBC is about as good as it gets in facing up to the dilemmas of this new world of fict & faction, where form trumps content. But listening to calls for a new more responsible, more honest version of Reality TV, as if it could become a sub-genre of wildlife documentaries, sounds like wanting to have your cake and eat it. The practice of politics is a constant effort to bi-pass or occasionally subvert publicly codified norms (aka rules). Norms, as Carl Schmitt told us, are anti-political, but this is precisely why we have them. The legislature and judiciary are a pain in the arse to the executive, which is why modern liberalism invented them. One of Tony Blair's most Schmittian moments - and there were countless - was when he deliberately courted defeat in the House of Commons over 90-day detention of suspects. This was a direct appeal from 'leader' to public, saying 'look what constraints I have to deal with, in my mission to keep you safe'. A conspiracy theory, on the other hand, is the suggestion that publicly codified norms offer no real constraint to politics in the first place. Norms are not represented as anti-political but extra-political: they run in parallel to the strategies and mechanics of power. This is why it is less often the executive that is charged with conspiracy (because the modern executive is after all partly defined in opposition to the legislative and the judiciary) than the free-floating bodies that were established long after Montesquieu, Madison and others had finished defining the branches of modern government. The CIA, M15, the Bilderburg Group, McKinseys and Davos are the target for conspiracy theorists, rather than governments as such. It is a common feature of many conspiracy theories that the President or Prime Minister was ignorant of what was actually going on. Today's news about the BBC lying about the Queen is impossible to unravel, either as a piece of politics or in terms of conspiracy. Were it true that the Queen had been captured storming off in a huff, it would make perfect sense for the woman from where all power stems (including that of the BBC) to have the information 'corrected'. Why wouldn't she? She is the most powerful person in the country, and it's neither flattering nor helpful for her personality flaws to emerge. The bottom line is - if she's important enough to create quite such a desperate clean-up job and such grovelling apologies, she's important enough to have the truth censored. But the crucial thing here is that to exercise scepticism is neither an expression of Schmittian/Machiavellian political realism nor of a conspiracy theory, for the following reason. To my untrained eye, it seems rather implausible that quite such a specific narrative would emerge via various channels simultaneously, and that BBC staff cut quite so many corners as is being suggested here. But on the other hand, it is plausible. So mediaeval is our constitution that not only do we have no basis for knowing what actually happened, we can't even classify our suspicions as a 'conspiracy'. Being who she is, it would be as proper for the Queen to censor freedom of speech as it would be for her to permit it; there are no rules at work here because the Queen is the source of all rules! Unlike the Prime Minister, who would be breaking the rules were he to rewrite a BBC story, or the Bilderburg Group, who are suspected of covertly absenting themselves from the rules, the Queen's status is such that she is incapable of living under rules even if she wanted to. Which is why they used to decapitate her sort in France. Something rather heart-warming emanated from the Department of Environment, Food & Rural Affairs a couple of weeks ago: a domestic policy was announced and defended on the basis that it would be a nice thing to do. The policy in question was the "right to ring" proposal, that there should be a public footpath the whole way around the coast of Britain. Rather charmingly, David Milliband, then head of DEFRA, argued that "We are an island nation. The coast is our birthright and everyone should be able to enjoy it. I want families to have safe and secure access to walk, climb, rock-scramble, paddle and play all along our coastline". This is exceptional for the following reason. I think it's Nikolas Rose who describes modern political reason as a constant quest for 'authority for one's authority'. Modern policy-making is inhibited by the constant anxiety of never being entirely sure what one should do next. Expert knowledge claims about the mechanics of society are then employed to alleviate this anxiety. In a post-ideological era, policies draw on a broader range of social-scientific frameworks (or authorities for authority), but these nevertheless become empty mantras that are used to try and clothe otherwise naked, vulnerable actions. It feels peculiar that Milliband didn't suggest there is a 'market failure' in coastal perambulation supply; or that he didn't defend the footpath in terms of Britain's 'competitiveness' and that of its tourist industry; or that he didn't propose that this would reduce social exclusion in some way; or that he didn't argue that this was an investment in 'public value'. Granted, this policy is unlikely to prove very controversial, so perhaps Milliband didn't need to invoke any social-scientific authority for it. But a less self-confident Minister may well have done so anyway, just to demonstrate that they and their department were talking the talk. As I argued in this Open Democracy article, evidence-based policy must be partly understood as a response to failings in our democracy. It is preferable to evidence-less policy or faith-based policy, but inferior to democracy itself. One certainly wouldn't want to move towards the sort of regime we have witnessed in recent foreign policy, in which politicians act purely on the basis of existential conviction. In some respects, I'm praising Milliband in quite Schmittian terms, which are risky. But this is also an example of how policy might be debated in a more representative type of political system, that is, in terms of intrinsic merits, not extrinsic ones. A metaphor: New Labour has tended to operate as a dietician, producing food with the best of intentions, on the basis of calculated analysis that it will achieve certain goals. But every now and then, it's nice when it acts as a chef, offering us food on the basis that it tastes good. Were I a Darwinist or computer programmer or systems theorist, I would look at Gordon Brown's new government and conclude that having pairs of brothers, married couples and cliques of best mates in one's cabinet is not a strength but a weakness. Since I am none of these things, I shall simply suggest that when things turn pair-shaped, the unusually high level of social capital in this 'government of all the talents' will swiftly become a stick to beat it with. When things turn nasty, as in war, the temptation is inevitably to create even higher levels of homogeneity and trust in one's inner circle, so we can expect to see things lean further in this direction. Andrew Rawnsley suggested something similar yesterday. I wonder if any Prime Minister has ever successfully resisted this urge? The rewards for doing so could be great. Had Blair been advised by an articulate sceptic of Republican America, as opposed to Jonathan Powell, he may still be in power today. Political cunning today is associated with triangulation - Clinton and Blair both prospered through publicly accommodating the arguments of their opponents. But could this not also be a successful strategy behind closed doors? Beyond the CSR green-washing of corporate 'diversity' speak, organisational scientists no doubt have good reason to stress the empirical (as opposed to normative) benefits of building teams with a diversity of perspectives. It comes down to Ronald Burt-type questions of non-redundant information (what, for instance, can the new Children's Minister still learn from the new Housing Minister, given they live together?) and, if you insist, something to do with information systems. The starker political implication of this new cabinet is that political professionalisation has reached unprecedented levels and will become worse (or better if you like that sort of thing). The next generation - Kelly, Purnell, Cooper, Milliband, Milliband, Balls, Burnham, Alexander - all have backgrounds as policy experts or leader writers, with the exception of Douglas Alexander who was a solicitor. Fears of political professionalisation date back to Max Weber, and one could equally complain that the older generation of Cabinet Ministers such as Jack Straw have never known a world outside of politics. But they have known a world outside of policy. Brown is rightly aiming to reimpose a distinction between the administrative and the political wings of Whitehall, but his new generation of leaders is culturally and psychologically oblivious to this distinction. Their political aspirations have been channelled through intricate understanding of policy construction, in a way that the farmers, fishermen and teachers of Blair's first cabinet never did. If politics is more than just policy, as Brown said in leadership acceptance speech, is there not a case to be wary of excessive policy expertise in the political wing of government, for the same reason that one might be wary of excessive politicisation of the administrative wing? Intellectually speaking, the Millibands may have got their fill of both, having sat at the feet of Poulantzas and the rest of their dad's friends through the 1970s. But watching Ruth Kelly and Liam Byrne's attempts at deep political thinking offers the same excruciating entertainment as an uncle dancing at a wedding. Granted, political theorising is no less abstract than the spreadsheets through which Liam Byrne views the universe, but, unlike consultancy positivism, it does at least have an account of its own abstraction.